Bance Shims are finely tapered inserts for traditional rail joints. Their need arises because of the ‘dip’ that results from the natural flexing of the joints under traffic. They have proved themselves in service worldwide over many decades. ‘Rail joint dip’ occurs as a direct result of wear on the underside of the rail head and on top of the fishplate – the upper fishing surfaces. It is not caused by permanent bend in the rails or wear on the rail surface. This ‘dip’ must be corrected for the safety of the track and rolling stock. A joint that is dipped by 3mm, which is common, cannot expand and contract. This is because the tops of the rail bolt holes drop onto the fish bolts and squeeze them against the bottoms of the fishplates holes. A number of different remedies can be employed to counter ‘dip’, but Bance Shims are the only effective long-term remedy. They also happen to be the cheapest and easiest to fit. Alternatives like new fishplates will not replace the wear on the underside of the rail head so the ”new” joint starts dipped. 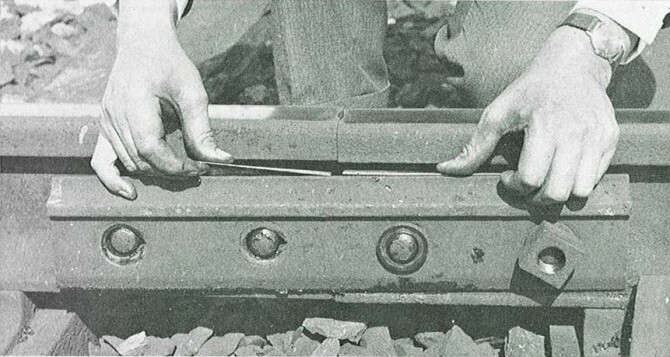 Bending fishplates and/or rails simply transfers the wear gap to the bottom fishing surfaces so the joint is still not supported and it drops back after a few trains have passed. So a “straightener” if thought useful should never be used unless shims have been fitted first. The reason for the effectiveness of Shims is that they are the only means by which all the metal worn from both rail and fishplates can be replaced. When a Shim is fitted the joint is immediately leveled, and it will hold its level for as long as a brand new joint. Bance Shims are equally effective for fine adjustment to high-speed track as for putting a good top on old, worn-out track. If ‘dip’ is allowed to set in, deterioration of the joint increases rapidly. It is therefore best to Shim early in the life of the joint. Increase joint life to match the life of the rail. Improve the running surface. Enable traffic speeds to be increased with a much smoother ride. Safer. The elimination of dipped joints removes the prime cause of batter on the rail ends, thereby reducing the chance of rail end failures. Economical. Quick to fit, minimal cost, and the life of the joint is extended indefinitely. Reduce track costs. The frequency of maintenance visits is reduced so improving the economics of jointed track. Technically the best engineering solution. The use of BANCE SHIMS saves money, improves safety and improves the quality of the track. It should be considered an essential part of every railway’s standard maintenance procedure.